The U.S. Clean Water Act outlines hundreds of parameters for testing wastewater for discharge. It also gives an in-depth explanation of a wide variety of fines from several thousand dollars to over fifty million dollars. Keeping wastewater treated properly and within federal standards can save your organization money and time. Wastewater treatment facilities test for COD, BOD, TSS, Ammonia, Nitrite and much more. Maintaining the right water treatment chemistries can keep you in compliance and running smoothly. BCMbio™ offers a premium range of microbial products designed specifically for wastewater bio-augmentation. These products reduce costs, maximize system efficiency and help maintain compliance with state and federal laws. All BCMbio™ formulas contain a strong consortium of enzyme-producing bacteria that work quickly to remediate problems from start to finish within the wastewater cycle. BCMbio’s wastewater treatment products feature application-specific bacteria strains to clean a wide variety of wastewater systems including municipal wastewater facilities, grease traps, septic systems, and wastewater lagoons to improve system efficiency, reduce sludge and odor, lower Total Suspended Solids (TSS) and improve BOD and COD levels. BCMbio™ manufactures single strains, multiple strain blends as well as pre-formulated, pre-packed products that are designed to work on large scale problems such as, fats, oils, and greases (FOG), pulp and paper, starches and hydrocarbons. These products provide quick solutions for a broad range of common wastewater problems. When more specialized issues arise our expert R&D team can help your organization with more specific solutions to remediate your issues. In many areas of the world, discharge of untreated (or poorly treated) sewage effluent into estuaries, streams, and marine waters has caused a continuing concern to environmentalists, health officials and residents. Sources of such discharge include farm and urban runoff, marine vessels and industrial process effluent. This untreated sewage also burdens the already stressed municipal waste systems. Governmental agencies, on local, national and international levels, have established guidelines and regulations governing the discharge of wastes. As a result of these regulations, there is an urgent need for reliable and efficient treatment of wastewater. The use of microbial products is a safe, easy and practical method for wastewater treatment. Microbial products improve water quality by increasing the biological diversity and/or activity in a wastewater system. Special microbial cultures are generated for specific applications through laboratory techniques including classic and innovative methods of selection, acclimation, and production. The select bacteria produce enzymes to break down organic material into water-soluble nutrients. The bacteria then digest the released nutrients, multiply and produce more enzymes to continue cleaning the entire system. A large biological mass develops which has the capacity to digest large amounts of organic waste. The digestion process of the microorganisms ultimately results in the production of harmless carbon dioxide and water. The type of enzyme produced by the bacteria is specific to the organic waste that it will digest. For example, Protease enzymes digest proteins; Amylase enzymes digest starches; Lipase enzymes break down fats, oils and grease; and Cellulase enzymes digest paper and cellulosic fibers. Since the bacteria and enzymes work together in the digestion process, the selected blend of the two is very important. The enzymes jump-start the digestion, while the chosen strains of bacteria produce more of the specific enzymes necessary to digest the organic waste in the system. Herbicide and pesticide residues, machine oils, petrochemicals, disinfectants, precursors for manufacturing processes, dyes, and chemical feed stocks all contribute to possible problems encountered in treatment of industrial wastes. These wastewater influents often contain unusually high concentrations of synthetic, organic, and/or hydrocarbon waste. Institutional, restaurant and hotel wastewaters can contain a high concentration of animal and vegetable fats and grease. This grease can accumulate in tanks and lines causing hydraulic problems. Resultant resistance and decreased flow can cause mechanical failure, displeasing odors, and excessive power use. Microbial products will break down much of the polluting influent to the waste system. They will digest toilet paper obstructing a household drain line, grease clogging a restaurant grease trap, oil spilled on the ground from an automotive repair shop and organic build-up in aquaculture ponds. They will also compost garden and other organic waste and eliminate odors in municipal waste sites and garbage storage areas. The concept of seeding an organic system with microorganisms having specific characteristics is well established for areas of industrial fermentation. These areas include industrial processes for the manufacture of antibiotics, cheese (both aged and cottage type), yogurt, wine, beer and even pesticides. Bioaugmentation is the process of inoculating specific micro flora into a given environment to enhance certain biochemical processes or to elicit desirable changes in that environment. Bioaugmentation of wastewaters usually involves a specific microbial product added at levels ranging from 2.0 to 8.0 parts per million (mg/l) times influent volume. The dosage depends upon the type of waste to be treated, environmental parameters, hydraulic detention time and design of the system. The environmental parameters, or factors affecting the performance of the microbes, are essential to the success of the product. The environmental parameters of the system include pH, temperature, dissolved oxygen (DO), biochemical oxygen demand (BOD), chemical oxygen demand (COD), total suspended solids (TSS), carbon, nitrogen, phosphorous ratio (C:N:P) and detention time. The microbes need neutral pH, warm temperature, plenty of oxygen, appropriate nutrients, and time to degrade the organics. Before using microbial products, it is imperative that several logical steps are taken. First, have a reputable wastewater analysis laboratory perform a comprehensive survey of the composition of the waste. Second, identify possible trouble components of the wastewater. This step includes monitoring the environmental parameters. Third, determine the overall flow pattern complete with relative concentration of these pollutants. Fourth, perform a study on composite samples of the waste utilizing suitable respirometry techniques to determine the treatability. Finally, speak with our microbial product experts to determine which product will best work in your particular system. Bioaugmentation can be used to help minimize the problems, which may occur in certain waste treatment situations as outlined above. Research has shown that the continual addition of seeding microorganisms into a biological waste treatment system can have an appreciable effect upon the type and number of micro flora in the system. The micro flora within a given treatment system is constantly undergoing changes in both numbers and types of microorganisms represented in the population. These changes are affected by environmental influences such as temperature; sources of carbonaceous or nitrogenous waste type and concentration; heavy metal concentration and other toxic substances; dissolved oxygen levels; and many other influences. These changes may not result in the selection of a population of microorganisms that are the most effective in degrading the type of wastes introduced into the treatment system on an intermittent basis. In this regard, bioaugmentation may help in supplying organisms effective in their catabolic character and capabilities, thus resulting in better overall treatment for a great variety of wastes. Given a sufficient length of hydraulic detention time and proper conditions for oxidation of the waste, bioaugmentation can be used as another tool to increase the efficiency and reliability of wastewater treatment. 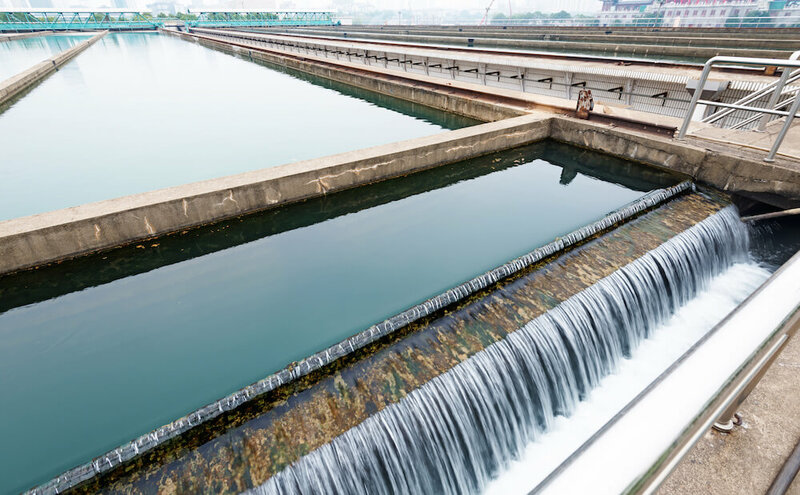 The numerous applications for microbial products include municipal and industrial wastewater treatment, aquaculture, remediation of hydrocarbons, composting and odor control. Microbial products will maintain the wastewater treatment system by breaking down the organic material and keeping the system flowing properly. These products are environmentally sound and totally biodegradable and benefit both the user and the environment by improving water quality and effluent.